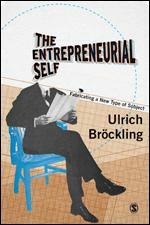 Ulrich Bröckling claims that the imperative to act like an entrepreneur has turned ubiquitous. In Western society there is a drive to orient your thinking and behaviour on the objective of market success which dictates the private and professional spheres. Life is now ruled by competition for power, money, fitness, and youth. The self is driven to constantly improve, change and adapt to a society only capable of producing winners and losers. The Entrepreneurial Self explores the series of juxtapositions within the self, created by this call for entrepreneurship. Whereas it can expose unknown potential, it also leads to over-challenging. It may strengthen self-confidence but it also exacerbates the feeling of powerlessness. It may set free creativity but it also generates unbounded anger. Competition is driven by the promise that only the capable will reap success, but no amount of effort can remove the risk of failure. The individual has no choice but to balance out the contradiction between the hope of rising and the fear of decline. Ulrich Bröckling is Professor of Cultural Sociology at the Albert-Ludwigs-University Freiburg, Germany.